Tom Foster is what I would call a ‘prolific’ Author extraordinaire who possesses an inexhaustible wealth of imagination, and shows to be an Author of much promise. 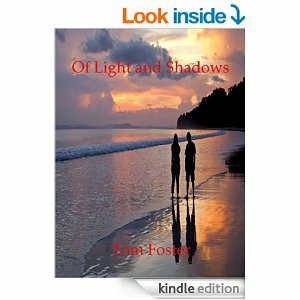 The “Of Light and Shadows” Book I in the Series is one of many books and projects the Author has produced and added to his repertoire of fine literature. This is a must read work, and we can confidently guarantee that our readers will be hooked into and completely mesmerized by the unfolding events within the story. Once immersed and carried away into the story and familiarized with the characters that dominate our attention, the unfolding situations and scenarios that sweep across the nation allows us to be swept away by the emotional rollercoaster existence of terror and heartache, hate and betrayal, and confrontation and situations which threatens the very survival of its citizens. In a world where virtually overnight as it were, the normalcy of all routinely daily chores and lifestyles are being plunged into a world of utter hostility, madness and confusion by an invisible evil presence; where friends and neighbors become formidable enemies, and where trust and compassion no longer exists. Book Description – Available in Kindle & Paperback to follow in the not too distant future. A single noise alerts Tyler that something is wrong, though as he steps from his bedroom he enters a world where nothing is as he remembers, and friends have become enemies. Into this uncertain world Tyler finds it necessary to fight, to kill, and to survive as he and his girlfriend Kera are attacked. Former classmates and friends turn upon the two as they are forced to fight for their lives, thrust into a hellish nightmare where nothing is as it seems and monsters lurk within the shadows. Into this madness the two find their way throughout the northern end of the Longbeach Peninsula, their home and haven for so long, seeking out whoever might remain. Little more than madness and destruction await them however, the bloody trails leading from so many homes attesting to the unrelenting insanity that has suddenly gripped the land. Only after gathering several of their friends to their side do the two realize that the greatest of threat lies not within the shadows surrounding their home, nor the frightening creatures that now roam the dark. Through blood and fire the small group soon learns of the greater threat, represented by a small group of friends turned enemies, who seek goals much different than their own.